Recently Barffie and I have entered a competition: http://unexpectedaustralia.asiaone.com/03_contest/main.php (Unexpected Australia Adventure). Here's my entry http://nadnut.liquidblade.com/?p=1938 and here's barf's entry http://barffie.liquidblade.com/index.php/2008/02/29/fly-me-down-under. We have been shortlisted! Basically we're in top 7 (http://unexpectedaustralia.asiaone.com/00_main/main.php) and there is a voting contest from March 3rd to March 10th. Basically the top 3 contestants with the most votes will win a 9 days trip to the destination we have chosen, which in my case would be Sydney and in Barf's case, would be Adelaide! If you can, I really do hope you will be able to plug us in your blog! We really need as much votes as I can get! The good news is that voters will stand a chance to win a MacBook Air, a Sony Ericsson K8501,a Nikon B60, a Nintendo WII and two Scandisk Ducati Thumbdrive (4GB)! How do you vote? You'll have to register here: http://unexpectedaustralia.asiaone.com/vote/register.php afterwhich, head to my userpage: http://unexpectedaustralia.asiaone.com/vote/description.php?vMemberID=202 and barf's userpage: http://unexpectedaustralia.asiaone.com/vote/description.php?vMemberID=229 and click vote for me! The bad news is that they will only accept one vote per username however the good news is that you can vote again after 24 hours! So pls vote everyday from March 3rd - March 10th!I really hope that you'll be able to help! Pretty pretty please? 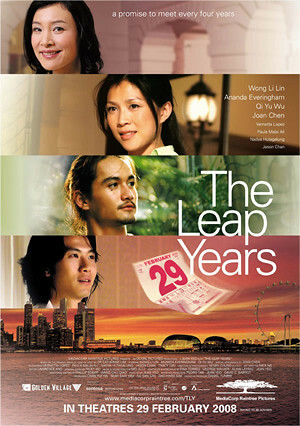 This is a romantic love story that evolves around a young Singaporean girl who unexpectedly meets her dream man on a special day - 29 February 1988 - when a quaint old Leap Year custom allows women to make the first move in a romantic encounter. Our heroine does precisely that. Hereafter she and the dream man, both exceptionally attractive and brimming with life's hopes and dreams, are caught in a dizzying spin of events that Fate seems to like visiting upon young lovers. "You will come together at last. But not yet, not yet," says Fate mischievously. The lovers meet every 29 February over 12 years, in breathless negotiations of the many pitfalls along the path of true love which has never run smooth anyway, before their hopes are finally fulfilled in a spectacular millennial culmination worthy of love's loftiest dreams. I think I can understand why movies made from novels are usually not as satisfying to the readers as reading the actual book. This is because it is usually very hard to capture all the details from a few hundreds page down to 100mins... But for ppl who have yet to read the novel, it will sufficient to capture all our attention. Wong Li-Lin is beautiful in her role and I can hardly stop myself from drooling over Ananda Everingham. There are times when i was watching and i feel more anxious than the characters themselves.. Like that scene when Li-Ann (Wong Li-Lin) lied to Jeremy (Ananda Everingham) that she is married and had a 2-yrs old child, my inner self was screaming "Why are you lying to him?".. Another point to make is the supporting cast. Not only are all of them superb in their acting, they are the ones who really help to make the whole movie more interesting. Although i understand the need to includes the scenes for the current day in between the scenes for the years before so as to balance the whole picture, I cant help but feel that it just drags the whole thing by a little little bit..